June 5, 1824, Col. Scott was born in Cornwall, Stormant Co., Ontario, Canada. 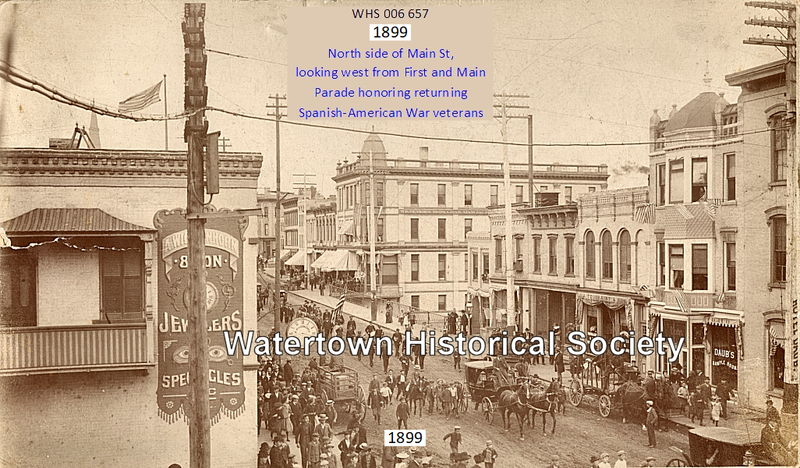 In 1866 Mr. Scott, after returning to Watertown, was married to Miss Emma Stewart Leonard, who died in 1901. She was a niece of the late Col. Daniel Jones. On Thursday evening. 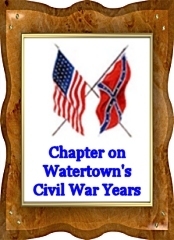 February 9, 1911, death claimed one of Watertown's early pioneers and one of her most esteem citizens in the person of Col. D. D. Scott, who passed away peacefully at his home, 409 North Church Street, at about 9:30 o'clock on that evening. Since the death of his wife he made his home with Miss Margaret Brennan and her sister Mrs. Ellen Enzensperger, whose devotion and care of him in his declining years deserve great praise. The news of his death was received with sincere sorrow by all our citizens, for everyone here who knew him — man, woman or child, all held him in high esteem. Mr. Scott suffered an injury to his thigh a few years ago, since which time he was unable to be out much, and for over a year past he was in very poor health. The last time he was on our streets was November 8th last, when he was wheeled to the polls to vote and then was wheeled down town and was pleasantly greeted all along West Main and Main Street by hundreds of our citizens. 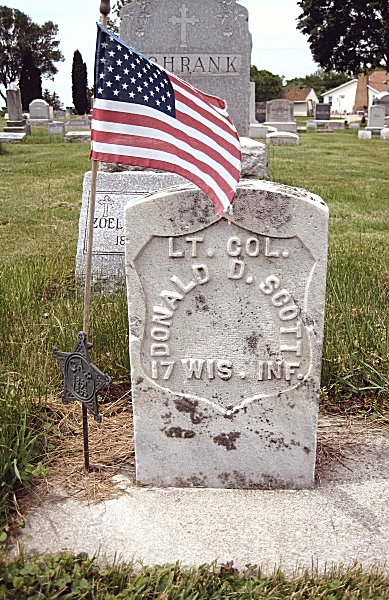 June 5, 1824, Col. Scott was born in Cornwall, Stormant Co., Ontario, Canada, where he was educated, and when 21 years of age he came to the United States and engaged in railroad work in New York, and afterwards in Vermont, and Ohio, and in 1855 he came to Watertown and engaged in railroad building with A. L. Graham, securing a contract for grading, bridging and ballasting what is now the C.M.&St.P. Ry. from Oconomowoc to Columbus, through this city. The road was known in those days as the Milwaukee and Watertown Ry. He also built part of the C.M.&St.P. Ry. between here and Madison, and in other places throughout the state he did railway contract work, his firm being the leading railway contracting firm in the state at the time, and Watertown in the fifties was the second city in size in Wisconsin. In his younger days Mr. Scott was one of the state's most well-to-do residents, but lost several hundred thousand dollars by the old Milwaukee & Watertown railway beating him out of it by the company going into bankruptcy. In 1855 Mr. Scott was married to Miss Catherine McGilis in Quebec, Canada, who died about eight months after they were married. Company D, 17th Wisconsin Regiment / Irish Brigade -- At the breaking out of the Civil War his patriotic spirit showed itself and on October 15, 1861, he was commissioned by Governor Randall to raise recruits for the Union Army and on March 18, 1862, received his commission as captain of Co. D, which was composed of young men mostly from Watertown and vicinity. The company was assigned to the 17th Wisconsin regiment and afterwards became part of the Irish brigade. The 17th Wisconsin was ordered to St. Louis and took part in many of the most important battles of the war. It arrived at Pittsburg Landing the day after the battle and shared in the terrible hardships before Corinth; was in the embankment for 80 days at the siege of Vicksburg, and was the first to enter the city at the close of the siege on July 4th. July 29, 1863, Mr. Scott was commissioned major, and on Sept 24, 1864, was made lieutenant colonel, though filling the position for some time previous. July 14, 1865, at Louisville, Kentucky, he was mustered out of service, and once more engaged in railroad contracting in New York, Ohio and Wisconsin. During the war Mr. Scott had a very peculiar experience. Mounted on a fine horse during one of the battles he engaged in he got detached from his regiment and found himself quite a distance away surrounded by five men of the rebel army. He immediately drew his sword and commanded them to disarm, throw up their hands, and marched them single handed in double quick time back to his own lines, the Johnnies submitting because he put on such a bold front they supposed there were more Union men closer at hand than proved to be. For this act Mr. Scott was greatly praised by his superior officers and the press of the North made great ado over it. During the war, on one of his furloughs home, our citizens presented him with a very handsome sword, which he always greatly prized. Mr. Scott served a number of years as deputy sheriff of Dodge County, he held the office of alderman several terms and also supervisor. When the late President Cleveland was sworn in as president for the first time  Col. Scott made an active campaign for the appointment of postmaster in this city against the late Chas. H. Gardner, the former being an old union soldier and the latter a confederate . Feeling ran high for a time, especially so as General Edward S. Bragg championed Mr. Gardner's candidacy. The result was that both old soldiers were sidetracked and the late Henry S. Howell secured the prize. Monday morning Col. Scott's funeral look place from St. Bernard's Catholic Church under the auspices of the O. D. Pease Post G. A. R., of which deceased was a member. Rev. Father Hennessey celebrated his funeral Mass and his funeral oration was one of the best ever delivered on a like occasion in Watertown. Father Hennessey received many fine compliments since then from those of all denominations who heard him. The interment was in St. Bernard’s Cemetery beside those of Mr. Scott s second wife, his first wife being buried in Canada.
. . . He made friends easily and he invariably kept them to the end, for he was true to every obligation of friendship. When he had an opportunity to do a favor he did not stop to consider how the act would affect himself, he did what he believed to be right and took his chances. He was by nature an everyday man and one who was glad to meet his friends at all times. He was the embodiment of all the higher qualities that can be found in human nature. There never beat in any human bosom a truer, more unselfish and generous heart than that of Col. Scott—in peace and in war he was true and constant to his honest convictions and Mother Earth has never closed over one whose life more honored our city.